Click here to learn “The components of an App” first! 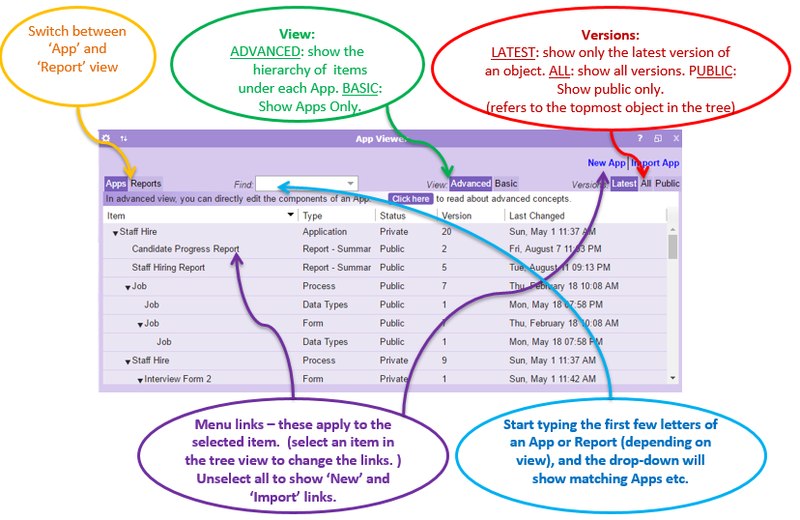 Apps, processes, forms ,reports, data types and other related items are versioned. There is a number starting from 1, assigned to each copy of an object that’s part of a version series of an object. A version of an item also has a Status. The status can be ‘private’, ‘public’ or ‘archived’. The purpose of all this is to stop changes to an App that’s in use (as changes can introduce bugs). So the version system keeps track of what’s in public use, which version was previously in use, and private copies of a version Admin users are editing. Finally items are dependent on each other, for example an App is dependent on its processes, which are dependent on Forms, etc. (Its a dependency tree). Private means a copy of an item that’s only visible to the user who is editing it. (Admin users can see others private copies). Public is the next status. The public copy is the one that everyone uses. There can be only ONE public version of an item at a time. This tile lets ‘Admin’ users create new Apps, or make changes to them. In ‘Basic’ mode, only the App is shown – use the ‘Open App’ menu link to launch the wizard that will let you make changes to the App. In ‘Advanced’ mode, you can directly select items inside the App, such as processes and forms. This lets you open them in editors with all features enabled. Please read concepts such as ‘Components of an App’, and ‘How to edit a form’, ‘How to edit a process’ before using Advanced mode. 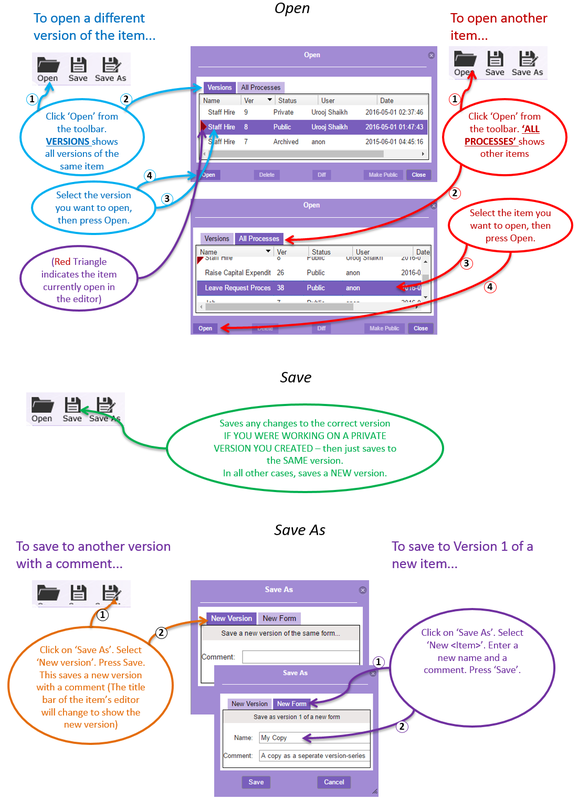 Open, Save and Save As operate on versions. When a process, form or report is open in an editor, you can open another version of the same item, or load a completely different item using the ‘Open’ button.